If you’re interested in a new mattress and love the sinkage and contoured support a memory foam bed provides, keep on reading! The Keetsa memory foam mattress collection features two beds: one soft, one firm, and both filled with pressure relieving memory foam. I did a deep dive into the Keetsa memory foam mattress collection, one of three collections in the Keetsa mattress line. If you have questions on construction, firmness level, price, or durability, you’ve come to the right place. If you’re short on time, click here to read a quick and handy summary. Keetsa was founded in 2007 and started off as modest, family-owned mattress manufacturer. The team grew alongside the bedding industry, and Keetsa now has mattress, pillow, bedding, and bed base product lines. Each Keetsa mattress uses eco-friendly materials, which you can have delivered as a bed-in-a-box, or through one of its unique retail stores. The Keetsa memory foam collection contains two beds: The Keetsa Cloud, a firm memory foam bed, and Tea Leaf Supreme, a softer mattress option. The main difference between the construction of the two mattresses is the thickness of the memory foam, which will dictate the comfort level. The Keetsa Cloud is a 10-inch, memory foam mattress, while the Tea Leaf Supreme is 12 inches tall. They both feature layers of memory foam that make up the comfort and core layers. It’s also worth noting that the foam meets CertiPUR-US® program standards, another way of saying the materials used are made without toxins. Cover: The cover of both mattresses is constructed with an unbleached, 100% cotton cover that is channel-quilted with fiberfill for comfort and breathability. The cover is also certified safe for contact with skin. Comfort Layer: The top layer of foam is Keetsa’s proprietary BioFoam® — a double layer of memory foam that aims to conform comfortably to the body. This top layer will be super soft and likely allow your body to sink in. The Keetsa Cloud will have a thinner layer of this foam, so it will render a firmer feel. The Tea Leaf Supreme has a thicker layer so the bed will be much softer. Core Layer: The bottom layer of both beds feature a firm memory foam layer, which should help with mobility and durability, along with lifting the sleeper up out of the bed after sinking into the initial comfort layer. The two comfort levels in this memory foam mattress collection ensure the sleeper doesn’t have to compromise on feel. If you’re a stomach or back sleeper who prefers strong and sturdy support for places like the hips and shoulders, the Keetsa Cloud’s firmer feel might be what you’re looking for. If you’re a side or combo sleeper who needs extra plush support for these pesky pressure points, the Tea Leaf Supreme might be calling your name. While both beds are a different firmness level, the qualities memory foam typically renders will probably be the same on each. This type of foam is known for deep compression support, pressure relief, and body-contouring properties. While some folks complain they feel “stuck” in the bed, oftentimes mattresses will include a firmer layer below (in this case, the core layer) to help lift the sleeper back up. Do beware: Memory foam is notorious for trapping heat, so if you’re someone who needs to sleep super cool, you might have better luck on a latex bed. A mattress that might have a similar feel to the Keetsa Cloud is the Novosbed Mattress, a firm memory foam bed that does a good job of contouring to your body and promoting solid pressure relief. For something on the softer side, check out Amerisleep AS4 Mattress, which allows the sleeper to sink a bit deeper into the bed, making it great for side sleepers. The Amerisleep also performed well on our edge support and motion control tests, making this a nice choice for couples. If eco-friendly and sustainable materials are your jam, then also check out the Loom & Leaf Mattress, which uses plant-based materials and has a similar, affordable pricepoint like the Keetsa beds. “This is my third Keetsa mattress…” Probably the most promising reviews I’ve seen are around folks who say they’ve ordered multiple Keetsa beds. They are pretty affordable and come in a range of sizes and types (coil, foam, and hybrid), so there really is something for everyone. 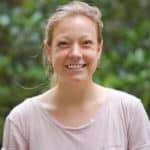 “Simple ordering process, and easy to unpack.” A lot of folks had only great things to say about Keetsa customer service, shipping, and unpacking. Since this can often be a hassle for many bed buyers, it’s nice to know Keetsa probably does it well. “Skews towards firm.” What I found interesting is many people on the Tea Leaf Supreme rated the bed a medium feel, versus soft. Take note, sleepers: If you want something super soft in a mattress, it’s best to test one out before purchasing. “The Cloud mattress doesn’t ‘give’ at all.” Similarly, a few folks who slept on the Cloud thought it was too firm. If you need a bit of plush support, stick to the softer models Keetsa offers. 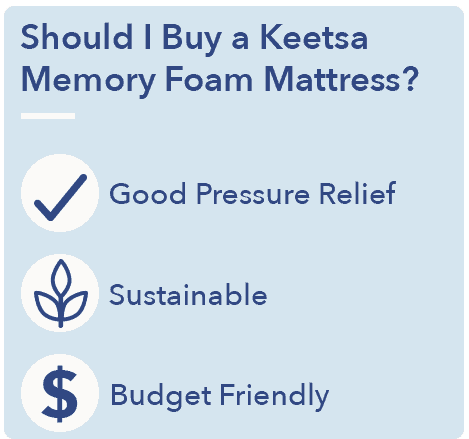 Is the Keetsa Memory Foam Mattress Right for You? Now that we’ve discussed this mattress collection, here’s why it might be good for you. You want pressure relief. Something memory foam does best is contour and compress, so those pesky pressure points get some juicy relief at night. If you know that’s what you’re looking for, you can’t go wrong with choosing memory foam. You care about sustainability. 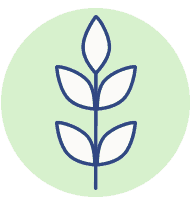 If you care about non-toxic and sustainable products, you’ve come to the right place with Keetsa. These beds meet CertiPUR-US® standards, feature organic cotton, and while the materials are flame retardant, they are fiberglass free. You’re on a budget. A Queen is priced under $1,000 for the Cloud, a nice deal for memory foam. That said, the Tea Leaf Supreme is a bit more expensive, with a Queen priced at $1,590. The Keetsa memory foam mattress collection offers up deep pressure relief, sustainable practices, and a choice between a soft or firm feel. If you’re looking for contoured support, limited motion control, and affordable quality, you might find Keetsa is a great fit in your bedroom.